I LOVE coffee. In fact most of us at Heffys LOVE coffee. Almost as much as we love Heffys BBQ Sauce. That’s saying a lot. 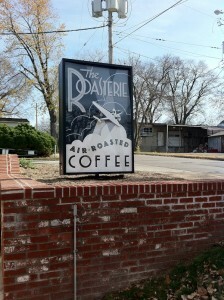 Recently, I met a really cool guy, Danny O’Neill (aka The Bean Baron), he owns The Roasterie here in Kansas City. We have lots in common, a desire to do good, a desire to make a product that people love, doing it with integrity among lots of other things. This guy LOVES coffee. He is passionate about doing it better than anyone else. So we sat down and swapped stories. I learned a lot. As I was leaving Danny suggested that we create a special blend of Roasterie coffee that could represent Heffys. Sold. So I recruited a few trusted coffee coneseuirs (minus brother Jason who was unable to make the trip to KC) and went to work. Their “coffee hunter” Paul Massard, led us through a coffee cupping. We tasted, discussed, rated, and repeated for hours. We used spoons to slurp (no better way to say it) up the fantastic nectar. Awesome. The smell was amazing, the process helped us blend 3 diverse beans together at specific ratios to create a uniquely Heffys Blend Coffee. You will be able to snag a bag of this coming very soon, so get on our email list well let you know when. Thanks to Amanda, Paul and Danny and all the kids at The Roasterie for letting us in. New friendships are exciting, new products are a privilege and sharing the stories of how both happen is just plain fun. This entry was posted on Friday, December 3rd, 2010 at 9:20 am	and is filed under BBQ News, Better with Heffys, Front Page News, Heffys News. You can follow any responses to this entry through the RSS 2.0 feed. You can leave a response, or trackback from your own site.